The backroom team at Ulster are learning to develop their respective roles as the Province moves forward assistant coach Dan Soper has said. As well as reviewing how players are developing, the coaches are reviewing their own performances and learning from each other. After a turbulent season last year when first director of rugby Les Kiss left his job by mutual respect and then head coach Jono Gibbes stood down at the end of the season, there was a number of new faces in the coaching staff. Dan McFarland came in as head coach, Jared Payne as defence coach and Soper as skills coach. 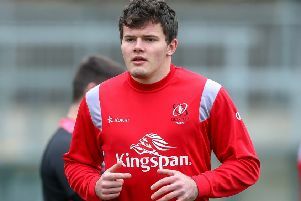 It takes time for new things to start to flow and Ulster have been no different, although the trend has certainly been on an upward trajectory. Following the recent draw with Benetton in the Guinness PRO14, McFarland was somewhat critical of himself after the game and said he and the coaching staff would take a look at how they had done things in the build-up to that game. He also confirmed that the coaching team were due to have a review themselves. Soper said of the review: ““It was good we are a new team together, so we are all learning about each other and we did look at our performances during the week, did we tick certain boxes. We are all still learning. “Dan will be first to admit that he is learning in his role as a head coach, Jared as a coach for the first time, I’m into the professional scene for the first time. So we are all still learning and. “To learn you first of all have to admit that if you have not quite nailed something and got it right, we are not afraid to do that. And we have done that. Soper was recently given a contract extension and he said: “I feel that I’ve only just scratched the surface as it has taken a wee while to find my niche as I suppose, in terms where I can add value.